Phyllis (Russo) Glover, passed away at her home in Melrose, after a lengthy illness, Sunday, August 26th. The beloved wife of the late David Glover, she was seventy nine years of age. Born in Woburn, she was the daughter of the late Christopher and Phyllis (Conte) Russo. Raised in the South End of Woburn, Phyllis was one of five children. She attended Woburn Public Schools and was a graduate of Woburn High School along with the Class of 1956. Phyllis and Dave brought four children into the world to whom they were dedicated. Phyllis loved to cook! So it was no surprise, she loved to entertain. Holidays were particularly special as she would share the joy and have all the family gather at their home to celebrate and delight in some of her very special meals. Phyllis loved being with family! As her children grew, grandchildren came along and made her so, so happy! She loved her grandchildren dearly! There wasn’t enoiugh time in the day to share all the special love she had for them. A very talented woman, there really was not too much Phyllis couldn’t do! In the kitchen, at the sewing machine and doing arts and crafts, keeping a lovely home, she had a wonderful talent for all. Sadly the last fifteen years were difficult for Phyllis. She overcame many medical obstacles, and the entire time with great faith, courage, strength and determination. 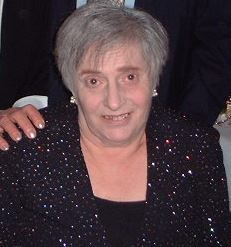 In addition to her parents, Phyllis is predeceased by her dear husband Dave, brother Larry Russo and sisterMary Duratti. Devoted mother of David L. Glover, his wife Valerie of ME, Paul Glover, his wife Elizabeth of Tewksbury, Karen R. Glover of CO and the late Sharon M. Sipes. Dear sister of Chris Russo, his wife Elaine of Medway, Ernie Russo, his wife Lillian of NH. Cherished grandmother of David L. Glover, Jr. of WA, Michelle Glover, John Glover both of ME, Amy Glover of Tewksbury, Dana, Jessie and Jamie Carter, Korri Sipes all of TX and the late Devin Carter. Also eight loving great grandchildren, nieces and nephews. I am so sorry for your loss. I have so many fond memories of your Mom. My thoughts and prayers are with you all. My deepest sympathy to the family of a dear friend from many years ago. Although I have not seen her for a very long time, I will always remember the great times we had together. She will be missed by all. So sorry to hear of Phyllis’ passing. Thinking of a of you.